When the Morphe x Jaclyn Hill Eyeshadow Palette was first released, I really wanted it and almost bought it a number of times but the shipping and customs fees were high so I always clicked out of the site. There was also the fact that I hadn't tried any Morphe eyeshadows so it was risky to order a large palette given that I was unsure of the quality. That changed back in September last year when Morphe launched on Cult Beauty and I was kindly sent the Dare To Create Artistry Eyeshadow Palette. 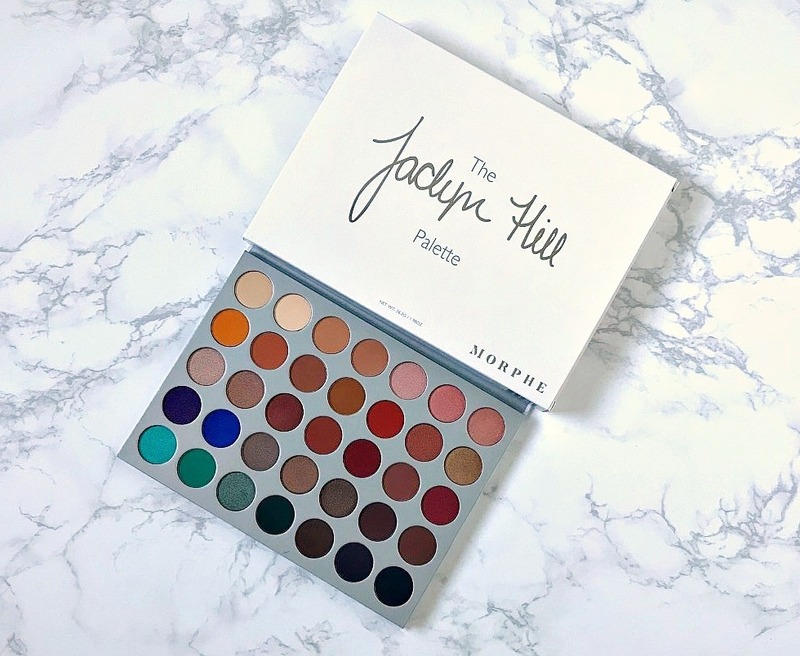 I was really impressed with the texture, pigmentation and longevity of the eyeshadows so I decided that I should finally go ahead and buy the Jaclyn palette and, of course, it was sold out as so many others had the same idea! This, obviously, made me want it more and I eventually ordered it and then was gifted it at the same time. One for me, one for you! You can enter my giveaway here. I've been using this palette for around 7 weeks now and want to share my thoughts on it with you today. Was it worth the wait? Is it worth the hype? One of the things that always put me off buying Morphe palettes in the past was the size - I didn't know how I would store a large palette but actually, I was pleasantly surprised with this one. It contains 35 shadows but it isn't excessively large and the packaging itself is quite slimline, yet sturdy. There is no mirror, which may disappoint some but at this price and with so many shadows, I think the lack of mirror is fine. The shade selection is pretty epic in this palette - nudes, greens, blues, pinks, browns and more, all in warm and neutral tones with a range of finishes - mattes, shimmers, satins and foils. The names of the shadows are printed on the back of the palette, which is a bit annoying - I personally would prefer the names to be under the shadows, but it's better than on a plastic insert in the style of the original Too Faced Chocolate Bar palette. Swatches completely unedited. From left to right: Enlight, Beam, Silk Creme, Mfeo, Faint, Sissy, Little Lady. Enlight: warm white metallic. Smooth in texture and pigmented. Beam: pale gold metallic. Buttery soft and pigmented. Silk Creme: Light peach matte. Moderately pigmented. Not quite as soft as the previous shadows but not dusty and easy to blend. M.F.E.O: Warm peach with a hint of brown in a matte finish. Similar in texture to Silk Creme but still easy to work with. Faint: Light warm pink metallic. Pigmented and creamy. Sissy: Warm peachy-pink with golden sheen. Pigmented and smooth in texture. Little Lady: Coppery-peach metallic. Creamy, smooth and pigmented. Creamsicle: Warm yellow-orange matte. Smooth in texture but less creamy than the metallics. Very pigmented. Butter: Medium orange matte. Moderately pigmented but blends and layers well. Pooter: Warm orange-toned brown matte. Smooth, soft and moderately pigmented. Pukey: Medium warm brown matte. Finely milled, soft and pigmented. Hunts: Orange-copper matte. Smooth, soft and pigmented. Firework: Deep red copper satin. Pigmented and buttery soft. Queen: Coppery-gold metallic. Smooth, soft and pigmented. 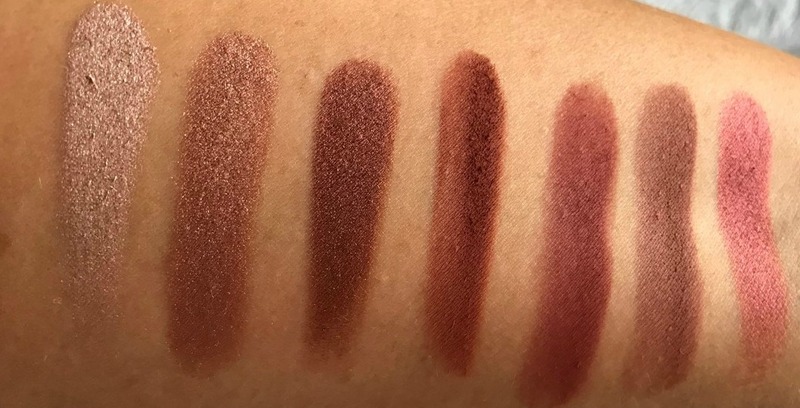 Swatches unedited. From left to right: Obsessed, SBN, Hillster, Roxanne, Jacz, Buns, Cranapple. Obsessed: Light warm beige with a metallic finish. Moderately pigmented and smooth in texture. S.B.N: Coppery brown metallic. Smooth and pigmented. Hillster: Dark copper toned brown metallic. Intensely pigmented, very smooth and soft in texture. Roxanne: Copper-toned brown matte. Moderately pigmented but sometimes applies patchily, which is a shame. Jacz: Warm red-toned brown matte. Feels a little powdery in the pan but applied evenly and blends well. Buns: Warm chestnut brown matte. Pigmented and smooth. Not as creamy as some other shadows but again, it performs well. Cranapple: Rusty-red metallic. Finely milled, pigmented and creamy. Royalty: Deep purple, leaning cool in tone with a pearl finish. Soft, smooth and pigmented. Twerk: Bright violet with a pearl finish. Pretty pigmented, applies evenly and is moderately soft in texture. Hustle: Warmish-taupe metallic. Smooth, soft and pigmented. Meeks: Stunning gold-bronze with a pearl finish. Finely milled, butter soft and pigmented. 24/7: Warm medium brown with a pearl finish. Buttery soft and intensely pigmented. Chip: Warm deep brown matte. Moderately pigmented but layers well. Feels a little stiff in the pan but blends well. Mocha: Deep red-toed brown matte. Very smooth in texture and pigmented. 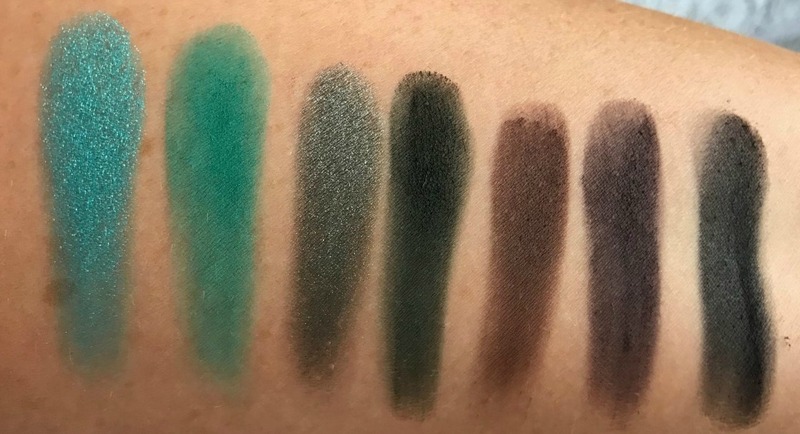 Swatches unedited. From left to right: Pool Party, Jada, Diva, Enchanted, Central Park, Soda Pop, Abyss. Pool Party: Turquoise-green shimmer. Creamy soft and pretty pigmented. Jada: Dark teal matte. Pigmented and finely milled but feels a little powdery in the pan. Diva: Cool medium green metallic. Smooth in texture, applies evenly and pigmented. Enchanted: Deep bottle green matte. Pigmented, very finely milled and soft to touch. Central Park: Neutral deep brown matte. Pigmented and very smooth in texture. Soda Pop: Matte purple toned black. Moderately pigmented but layers well. Slightly stiff in texture but blends well. Abyss: Neutral black matte. A little stiff in the pan but applies evenly. Moderately pigmented. It's missing a matte cream/white shade as that's what a lot of people use for a base. I think Enlight and Beam are very similar and would have preferred one to be matte. There are a few warm red-browns that are quite similar and it probably isn't necessary to have so many, which would have given room for a strong pink, a yellow and another green. That being said, I appreciate that there are pops of colour in the palette and if you didn't own a lot of eyeshadows or maybe wanted to downsize your collection, this one palette will cover most options. Although the shadows aren't all creamy in texture, they do perform well and I haven't had a problem creating any looks. I also appreciate that the shades don't all blend into one colour. For £37, I think this palette is a good deal - 35 shadows that perform well and a wide range of shades. Does it compare to a Natasha Denona or Pat McGrath palette? No, but I wouldn't expect it to given the price difference. Do you own this palette? What do you think of the shade selection? I'd love to hear! All products are bought by me, unless otherwise stated. This palette was kindly sent to me but this is not an ad as I was not paid to mention it. Please see ASAI rules for bloggers in Ireland here. Opinion is always my own. Affiliate links may be used.